As a family-owned and operated manufacturer, we make all of our decisions in-house. Our reach, however, is far and wide. Mills Manufacturing regularly exports our products around the world, including more than 65 other nations. Our parachutes ensure that every landing is successful. With our parachute manufacturing expertise and machinery, we’ve made these lifesaving devices for the better part of a century. It’s an honor to protect those who put their lives on the line for the safety of others. Because our 150,000-square feet of facilities are located near several major east coast ports, we can coordinate efficient shipments to destinations around the globe. Contact us today for a quote and more information. When it comes to airdrop and recovery operations, cargo parachutes are critical. Extraction parachutes can pull out loads ranging from 2,500 to 10,000 lbs, depending on the aircraft type. 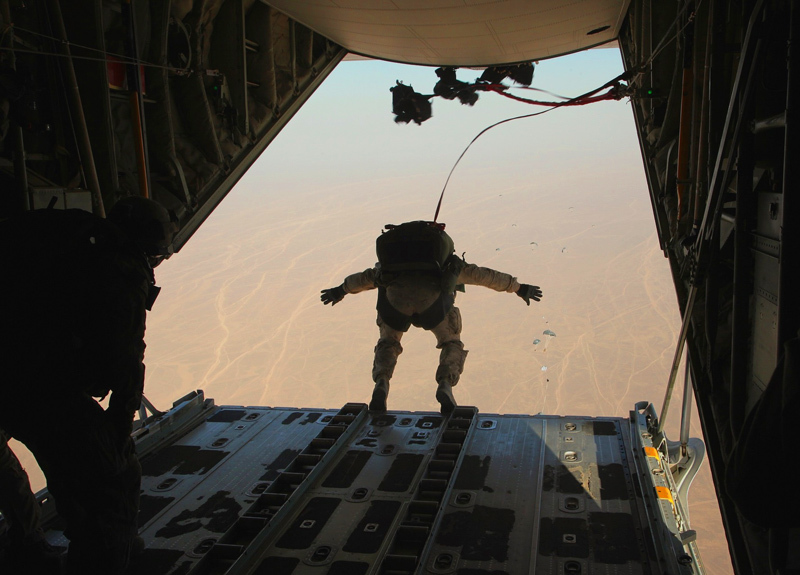 Most deceleration parachutes we manufacture are procured by the US Air Force and many NATO countries. We can also manufacture custom military parachutes as requested. View a full list of our parachute manufacturing makes and models. If you’re interested in non-parachute, military-grade contract cut and sew, click here.